Careful dyno development work by Superchips combined with real world testing has enabled the Buckingham based performance specialist to realise healthy power gains, whilst retaining full factory failsafes and environmental protocols. 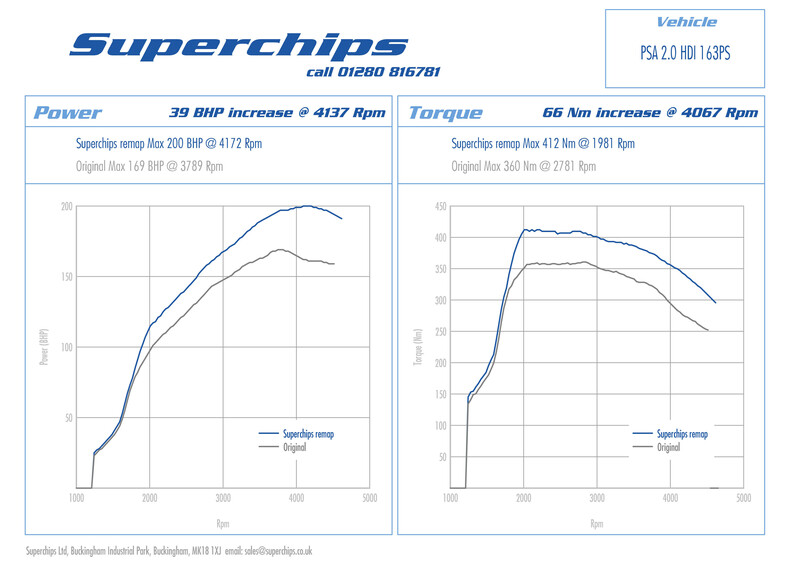 Back to back dyno testing has proven that the Superchips ECU remap enables these 2.0 HDi models to produce a sizeable extra 39bhp at 4137 rpm. On the road, this translates into extra performance for overtaking, fast cruising or simple enjoyment, making these 163PS PSA models feel much more exciting to drive and own. Impressively, these power gains are matched by a healthy torque boost of 66Nm at 4067rpm, increasing the low rev response of the 2.0 HDi engine, reducing the need for gearchanges and large throttle inputs to make rapid progress, making these PSA models easier and faster to drive. Yet this added performance isn’t produced at the expense of these Citroen / Peugeot models’ fuel economy, because thanks to the extra low-rev urge and throttle response fuel consumption can improve by up to 7% if driven in a ‘like for like’ manner with the standard car. The normal RRP for the Superchips ECU remap for these PSA models is £455.00 inclusive of VAT and installation, but customers can take advantage of Superchips’ special offer now and enjoy this performance and economy for just £365.00.